Freedom Summer Teach-in Film, presentations & discussion. In 1964 the Mississippi Summer Project organized volunteers from across the country to travel to Mississippi, one of the nation’s most viciously racist, segregated states, to conduct a major voter registration drive. This historic effort, which became known as Freedom Summer, helped to spur passage of the Voting Rights Act just one year later. On the 50th anniversary of Freedom Summer, this Community Teach-in will chronicle the progress of civil rights in the last fifty years and discuss the most recent attacks on the right to vote, which threaten the hard-fought gains made by the heroes of Freedom Summer. Full details are on the Freedom Summer Flyer. Video by Cassandra West of Seeding Chicago/New Media Access to capture the spirit of the day. Thank you, Cassandra! The weather conspired to make Saturday, September 28th, a great day for the 2013 Green Living & Learning Tour. The tour hosted nearly 400 participants in the 17 tours and demonstrations highlighting innovative examples of sustainable living in Oak Park & River Forest. The Green Living & Learning Tour was organized by a great team of Green Community Connections' talented, passionate volunteers, and was made possible through the generosity of the site hosts and guides who shared their homes and their experience with their neighbors. The Green Living & Learning Tour offered participants opportunities to see first hand homes that are using renewable energy -- solar and geothermal, & energy efficiency strategies -- a white roof, tankless hot water heater, and multiple design features that make a home more energy efficient. Water conservation and management was also a highlight including sites that capture 100% of the rain that falls on the property for use on gardens and lawns. Use of native landscaping drew significant interest -- both for its beauty and for the benefit of providing water conservation and habitat for bees, butterflies and birds. Partnerships were key to the success of this year's tour. The newly organized "Wild Ones!" chapter organized the tour of native plants at Cheney Mansion and the Native Landscape Mini Tour. Seventy-five people gathered for the closing to enjoy a Harvest Picnic at Field Park co-hosted by the Sugar Beet Co-op. Sugar Beet did a tremendous job of pulling together a delicious spread of fresh food -- largely from local gardens and farmers. Special thanks also goes to the tour sponsors. New sponsors including Cindy Gajewski with Beyond Properties, First United Church of OP and CYLA Design Associates, joined repeat sponsors including Seven Generations Ahead, the Village of Oak Park, the Village of River Forest, the River Forest Park District, Green Home Experts, and WebTrax Studio. Ecological principles were designed and built into this sustainably built home - the first of its kind in the Oak Park/River Forest area. The home includes renewable energy, energy efficiency, water and resource conservation, and toxic free materials. It's water conservation features include rainwater catchment for irrigation, native landscaping, permeable driveway and water-saving faucets and showerheads. The homeowners have welcomed many visitors into their home since 2008 when it was built and look forward to this year's tour. The Environmentalist’s Dilemma: Is it possible to keep your home warm in winter and cool in summer without doing a whole lot of damage to the environment? It is, and what's best, it's possible to do it on a reasonable budget. After sealing and insulating their house, the homeowners had the warmest winter in their home in 15 years and their energy bills were lower than they had ever been. Learn about air sealing and insulating and the fantastic rebates available to help make a more comfortable, environmentally friendly, (and valuable) home a reality. The Bonus: See a blower door test in action: a diagnostic tool designed to measure the air-tightness of buildings. and to help locate air leakage sites. Get tips on how to stay safe while biking in an urban area. Greenline Wheels’ safety experts are teaching safety and adventure as part of the Green Living & Learning Tour. Instruction focuses on basics such as checking and fitting gears, signaling, braking, and more. Greenline Wheels representatives will also familiarize participants with other biking supports that they offer. For the end of the day, all are invited for a Harvest Picnic gathering at Field Park, hosted by Sugar Beet Co-Op. All are welcome to join us at 5:00 p.m. in the northwest corner of the park (Berkshire & Woodbine) for fresh food, fun, prizes and community! For more information about the event, including registration information for all 18 sites, visit the tour page at Green Community Connections. as told to GCC by West Cook Chapter co-founder Ginger Vanderveer Let’s go a little wild on September 28th and visit the native side of Oak Park during the Green Living and Learning Tour 2013. This stop on the all-day tour serves as the West Cook Chapter Wild Ones September meeting; all are welcome to attend the event and/or to join the local chapter. Wild Ones promotes the use of native plants in landscaping in order to save eco-systems that nurture bees and butterflies – and vice versa. On September 28th, starting at noon, visit Cheney Mansion in Oak Park and explore the potager (kitchen garden) there. Our host, Charlie Ruedebusch, will lead a guided tour of the Cheney garden from 1 to 2 p.m, describing how the garden has evolved over the past ten years and sharing the joys and benefits (and pop a few myths) of choosing native plantings in the home landscape. Native plants attract beneficial insects to help pollinate the vegetable garden. Bring a few small paper bags and a pen – you’ll get to collect seeds of the native plants you most desire in your garden. After Charlie’s tour, at 2:30 p.m. there will be an opportunity to join a group bicycle ride across Oak Park searching out food sources for bees, butterflies, and birds. We will visit gardens with native plantings that serve these creatures well. Bees and butterflies sniff out the fragrance from the nectar of native plants because it’s a fragrance they’ve smelled for thousands of years. Birds chomp greedily on the seeds of these same plants. On the bike trip we’ll admire the diversity of these hardy natives and how well they manage in our soil. Parks, schools and churches offer great opportunities to use green space to feed the creatures that work so hard pollinating the food humans eat. The bicycle tour will make stops at Scoville Park, Jackson Boulevard parkway, Good Shepherd Lutheran Church, Elmwood Street, Beye School and more. The 2013 Tour Map is available so that visitors who wish to see these gardens on their own may stop by these locations as well. From big to small, parkway to front yard, all native to mixed plantings - you’ll see a variety that will inspire you to add some natives to your garden. We also hope to have some sightings of butterflies, birds, and bees. Visiting these treasures at a leisurely pace will be our goal for the afternoon. Join us and feel the simple pleasure of going native. According to the architect, 80% of the old home was recycled, and the new home is 60% more efficient than current codes require (see more details from the architect in this Wednesday Journal article). The indoor rainwater collection system (including the 2,000 gallon tank!) was adapted from one the Chesneys saw in a home in River Forest “whose owners [Bill Gee and Sue Crothers Gee] so graciously shared their knowledge with us,” said Megan. She says that in 2008, when they began their project, “green building” was just taking off. “Geothermal was something done more in Europe than the U.S., and when we inquired about a grey water system, we were told it couldn’t be done in Illinois.” The new home is heated and cooled by a geothermal system. 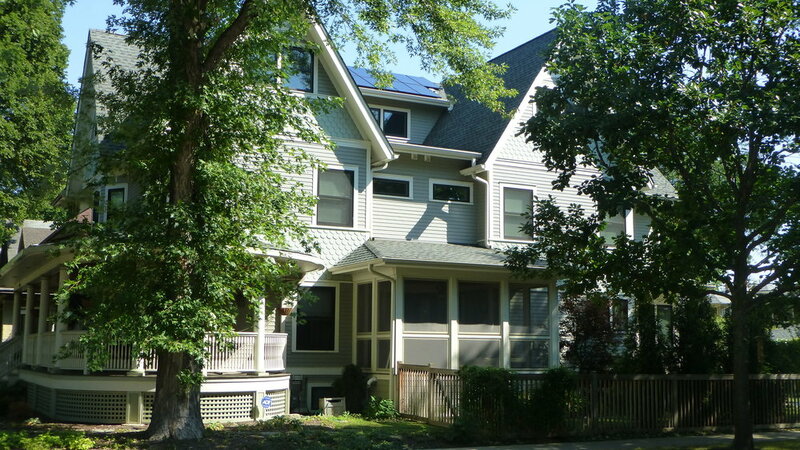 You can visit the Chesney’s Oak Park home during the Green Living & Learning Tour in Oak Park and River Forest on Sept. 28th. For more information about the event, including registration information for all 18 sites, visit the tour page at Green Community Connections. Ever since she was a child, Lisa Kozinski, owner of an Oak Park condo you can visit on the 2013 Green Living & Learning Tour on September 28, has entertained thoughts some of us might be afraid to face, such as, “What if the water stopped running through the pipes? How would we get water then?” As she got older, that line of thinking “intensified” when she fed the thoughts with research, films, and books such as Barbara Kingsolver’s Animal, Vegetable, Miracle: A Year of Food Life. From Kingsolver’s book (summarized at bottom), Lisa was led to read others in which authors shared their similar beliefs, that “we are heading for a time when going to a fully-stocked grocery store in any season will become a thing of the past,” she said, adding, “We need to equip ourselves with the skills it will take to survive when such a time occurs.” Lisa has found this kind of thinking “oddly comforting” – primarily because it confirmed her earlier thoughts and gave them framework and purpose. She says she felt a sense of urgency to make the changes in her life that would address these ideas. Visit Lisa, her family and the garden in back of their condo during the Green Living & Learning Tour in Oak Park and River Forest on Sept. 28th. After checking out the raised bed gardens, composting and rain barrel in the tiny back yard, visitors can head upstairs where Lisa will be discussing various methods of home food preservation, including canning and fermentation. Under the umbrella of canning, we will talk about making fruit jams and pickling vegetables. As for the far more ancient method of lacto-fermentation, we will discuss how to make milk kefir, yogurt, and fermented vegetables, such as pickles and sauerkraut. There are many nutritional as well as environmental benefits to both of these methods of home food preservation.